When a third-floor walk-up unit hit the market in the 1970s apartment building where architect Jack Chen had been renting, he jumped at the chance to own his first home. 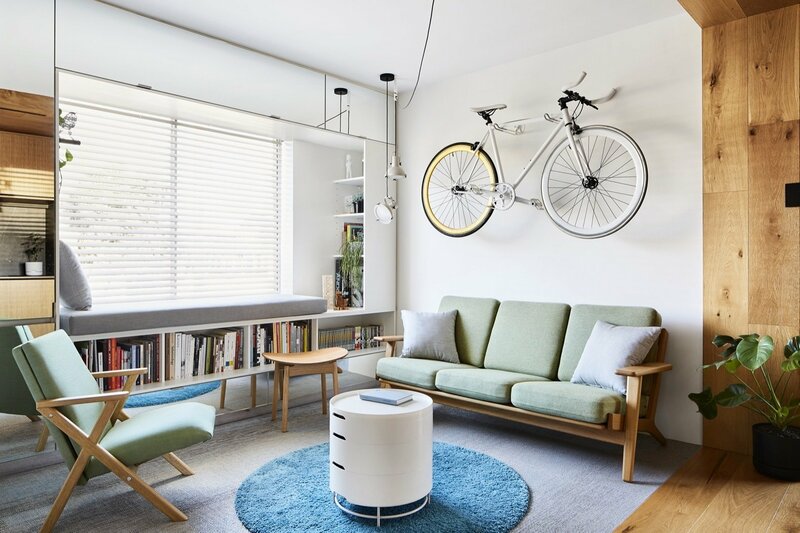 Here was the opportunity he had been waiting for—ever since Chen moved into his ground-floor rental a year ago, he had wanted to improve the unit’s livability, but was stymied by his tenant status. A clear delineation lies between the oak-clad box that houses the entry, kitchen, and bathroom on the right, and the white-walled living room and bedroom. Yet Chen’s new one-bedroom purchase also posed multiple challenges: an awkward layout, the lack of a working kitchen, and a tight budget. 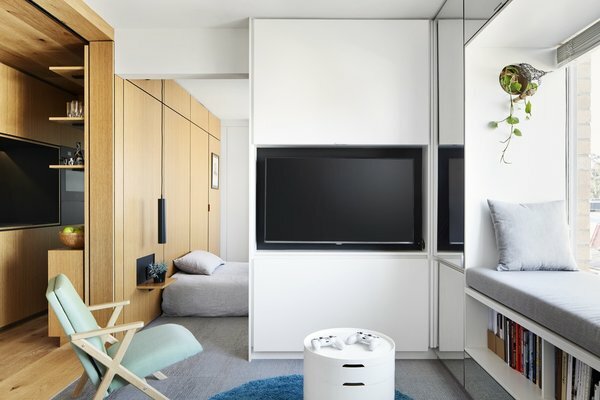 At 376 square feet, the unit is the smallest project he has ever worked on at his firm, Tsai Design. 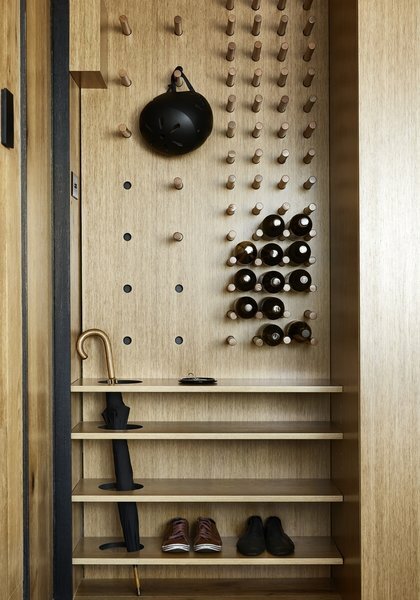 The multifunctional organizer at the entry includes an umbrella stand, a shoe rack, and an adjustable pegboard that serves as a wine rack and hat/helmet rack. After identifying the spaces to prioritize—the entrance, the kitchen, and the bathroom—Chen and his team inserted a floor-to-ceiling cabinetry and wall system into the existing layout. Created in collaboration with a cabinetmaker who specializes in high-end hotels, the multifunctional system conceals an abundance of storage as well as space-saving furnishings. A multifunctional built-in conceals this TV screen and a pull-out work station. The computer monitor is hidden in the adjacent cabinet.